GOLD STOCK STRATEGIST: ATW Venture Corp.
ATW Venture Corp. an Australian-based gold mining company focused on consolidating and exploring gold assets in Western Australia, and commencing production by the second half of 2008. The company’s strategy is to move aggressively into production over the next 6 to 36 months on its two existing gold mines and use cash flow from those operations to explore and develop additional projects (Argentina) and to expand through acquisition. The Burnakura Gold Mine is outfitted with a fully permitted 160,000 tonne per annum (450 tpd) CIL gold plant, rolling stock, underground equipment, workshops, office space and a 90 man camp. The project covers 12km of prospective strike length along a major auriferous shear zone and mesothermal gold system. Management believes potential exists to expand the low grade surface and high grade underground resources on the property. ATW's current focus is to streamline production facilities at Burnakura. Indicated resources are 400,000 gold equivalent ounces. Their goal is a first gold pour the company’s in mid 2008. The Gullewa Gold Mine is located 300km south west of ATW’s Burnakura Gold Mine in Western Australia. Mining infrastructure at the Gullewa Project include a turn-key gold operation with a Carbon-In-Leach plant capable of up to 300,000 tpa (tonne per annum) gold production, a licensed tailings disposal facility, a 50-person camp, offices, workshops, bore fields and haulage roads. Indicated resources are about 900,000 gold equivalent ounces. ATW also has an interest in northwestern Argentina gold-copper-silver mine. ATW is scheduled to begin a new drill program at the Amarillo project this year. ATW has a joint venture with the property owner, Marifil Mines Ltd. where ATW can earn up to a 70% interest in the property over a period of 5 years. 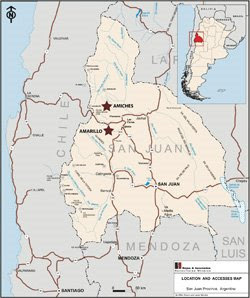 The Amarillo gold-copper-silver project is located within the Veladero-El Indio gold belt on the Argentine side of the Andes. This belt is becoming an attractive area for major mining companies investing substantial funds exploring for world class gold deposits. The belt has several major discoveries including Barrick’s 2 deposits lying to the north of Amarillo, Veladero (12.6 million ounce gold reserve) and Pascua Llama (18.3 million ounces of gold reserve) as well as a very high grade El Indio copper gold mine. Infrastructure at and near Amarillo is limited. Fresh water can be found in creeks several miles downstream. Power and industrial facilities are effectively unavailable in the region. However, domestic power plants supply the area with an estimate of 20,000 inhabitants. Three fuel filling stations exist at Iglesia, Las Flores and Pismanta sites. These supply local power needs at Barrick´s nearby operations. A March 2007 ATW presentation suggested Amarillo could hold 3 million equivalent gold ounces (au-cu) based on the geology and nearby mineralization in the rich Veladero-El Indio gold belt. However, the economic feasibility has not been established for this project. ATW Venture Corp. has a total of 1.35M oz gold compliant with Australian regulatory authorities. Note, these ounces are not compliant with Canada’s 43-101 regulatory regime. These resources are likely to be expanded with additional exploration. ATW Venture Corp. production is not hedged, has no debt, and has 26 million warrants outstanding maturing as early as December 2009. Cash currently available as of May 2008 = ~$17,000,000. Production projections range from 40,000 up to 100,000 per year once both Australian mines are fully operational. For purposes of modeling, ATW Venture Corp. production is projected to be 10,000 oz. in 2008; 40,000 oz.in 2009; 65,000 oz. in 2010. Management is experienced and passionate about their projects, two important qualities. The major troubling indicator is the relatively high cost of production estimated by management to be $500 per ounce. I suspect it will somewhat higher given it is based on past production when energy costs were much lower. This is the wild card in my opinion. High cost producers have very volatile share price swings when the price of gold fluctuates. If ATW can control costs in Australia, it should do very well once it is in production. The following valuation methods are what I use to value ATW Venture Corp. for my investment purposes and provide a range of short-run and potential long-run value. Of course, different assumptions would produce different valuations. The reader can assess the reasonableness of the assumptions. $4.43 per share using ATW Venture Corp.s 1,300,000 oz. gold equivalent resource estimate. It could be worth a great deal more if the Burnakura Gold Mine, the Gullewa Gold Mine, and the Amarillo Project prove up additional resources. The majors are paying about $280 an ounce for buyouts at $950 an ounce POG. 1,300,000 times $280 an ounce equals $364 million. $364 million divided by 85.6 million shares (fully diluted) equals $4.43 per share. Full disclosure: I do not own shares in ATW Venture Corp. The information provided in this post is believed to be correct, but not guaranteed. Investing in junior gold miners entails risks. Readers are responsible for their own investment decisions. Do your own due diligence. I bought a little of this. The thing that's nice about it is getting the two working mills for a really low price. The thing that's not so great is the short mine life based on NI43-101 especially at BurnaKurra. They claim they can prove up more oz. This is the key to success. The next short term catalyst is the conversion of the JORC resource for GULLEWA into an NI43-101. That's due any time. Like a lot of Jr near producers, the price is about as low as its been and is now probably a good entry point. Don't buy too much incase you have to get out.